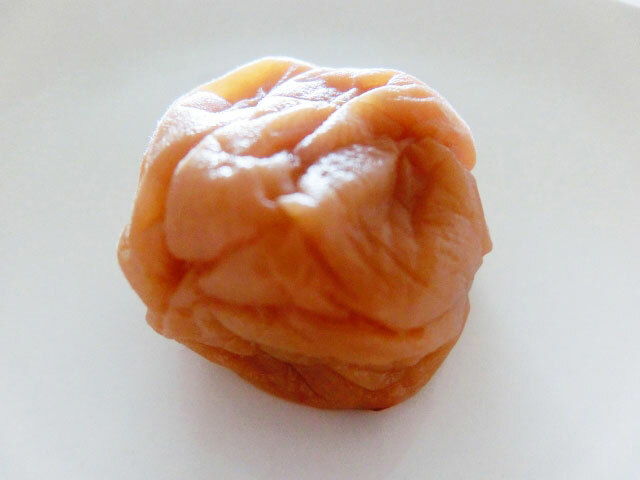 Did you make yudofu last month? Wasn’t it perfect for a cold January? 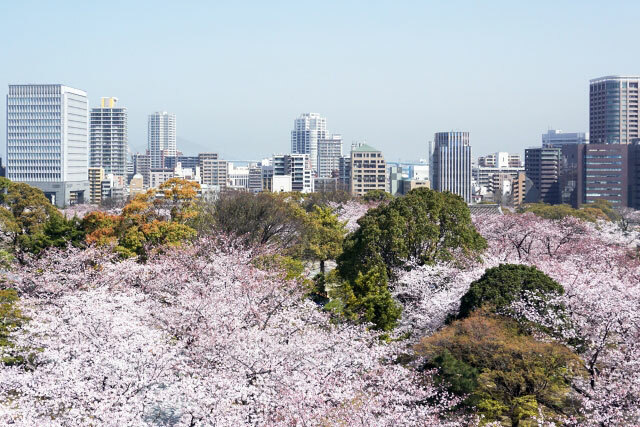 This month, we’re excited to feature Fukuoka, Japan’s sixth largest city, and home to mizutaki. 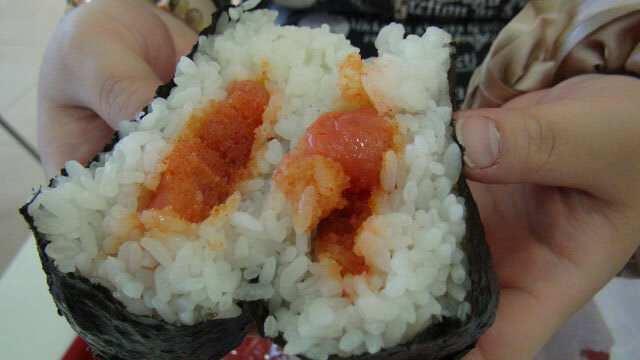 As foodies and travelers, we love the cuisines, cultures and special areas of Japan. This month, as part of our new series, A Food Lover’s Tour of Japan, we explore the city of Fukuoka, its history, culture, natural surroundings and famous mizutaki. City of Fukuoka, as it’s known today, was the result of the merging of two historic towns, Fukuoka and Hakata. Fukuoka was the feudal castle area of the Kuroda family, on the west bank of the Nakagawa River, and Hakata was the ancient center for international trade with Korea and China situated on the east bank. The city of Hakata eventually got destroyed because of a battle in 1569, and in the early 17th century Fukuoka began to emerge to Hakata resulting in the merged city of Fukuoka which was officially inaugurated in 1889. Today, Fukuoka prefecture is a major metropolis and cultural center, often known as the gateway to Kyushu, where one can see the historic sights of Nagasaki, experience the volcanic activity at the Aso Caldera, enjoy Japan’s best surfing along the Nichinan Coast, relax at onsen hot springs, and learn ceramic arts from Saga’s three legendary pottery centers. Fukuoka sits in the northwestern part of Kyushu and faces three straits—the Sea of Suo to the northeast, the Sea of Genkai to the northwest and the Sea of Ariake to the southwest–that border Continental Asia. The spirit of the two original towns that make up Fukuoka still influence the character of the city today. Fukuoka City, which is often known locally by its ancient name of Hakata, is the main urban area of Fukuoka Prefecture. 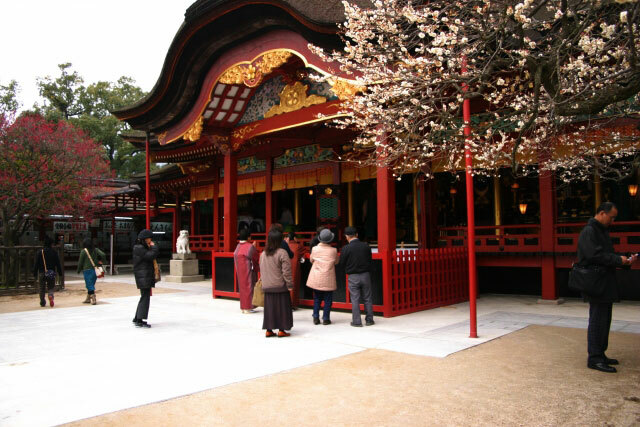 Within the prefecture are smaller cities and scenic areas that are worth a visit, including Dazaifu, the location of the Dazaifu Tenman-gu Shrine, where students seek blessings for academic achievement. The shrine is also famous for the countless varieties of red and white plum trees and irises. Kitakyushu, another city in Fukuoka, is a unique blend of medieval and modern industry. The Senbutsu limestone cave is a scenic spot in Kitakyusyu and is full of stalagmites and stone pillars. Many interesting museums can be found in Kitakyushu. Western Fukuoka prefecture is lush with azaleas and many old temples and shrines, including some that are dedicated to water deities and to the goddesses of fertility and easy childbirth. The southern part of the prefecture is an idyllic place to relax in the hot springs and onsen spas. While a visit to the prefecture is sure to provide varied experiences, Fukuoka City itself is teeming with things to do. The city center, or Hakata District, is home to the business area of Fukuoka, as well as to the Kushida-jinja Shrine, which hosts one of the main summer festivals held in the city. The riverfronts in the city are always bustling, especially in the Nakasu / Tenjin areas. Approximately 3,500 restaurants and food stalls can be found in Nakasu and Tenjin thrives with fashionable shops and department stores. You can even catch a baseball game at Fukuoka Dome along the main waterfront area! And if you’re looking for time in nature, the Kashii / Shikanoshima Island areas along the coast offer history, views, water and serenity. Fukuoka’s incredibly diverse international influences show up in its food, just as much as its culture. Mizutaki originated in Fukuoka, and means “water stew”. It’s a deceptively simple dish that was inspired by European consommé and chicken dishes from China. 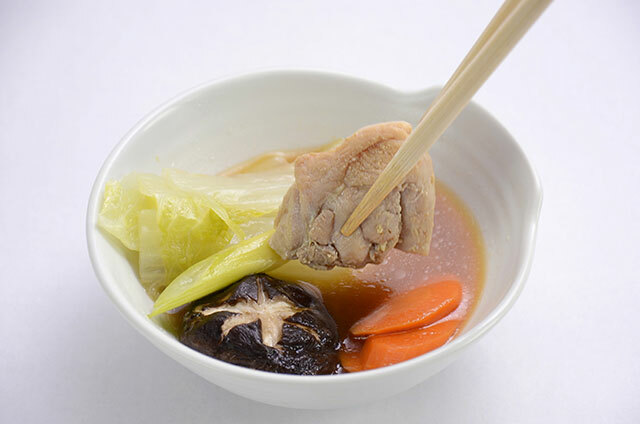 To make mizutaki, chicken, which is consumed more in Fukuoka than any other place in Japan, is boiled along with vegetables in a kelp-based broth, without any other seasonings. 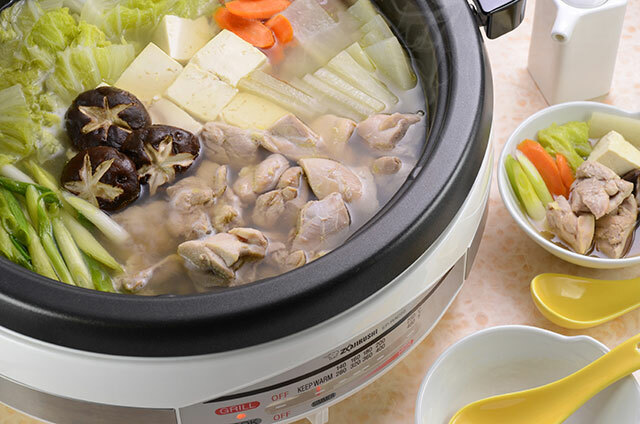 Once the chicken and cabbage, carrots, daikon radish, mushrooms and green onions are cooked, each person then take the ingredients in individual bowls and eat with tangy ponzu sauce. Rice can be added to the leftover broth, cooked and eaten as a savory soup or porridge. 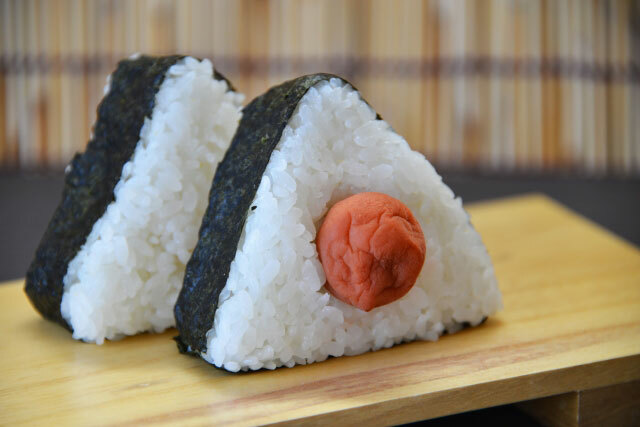 Two dishes in one! Try out our recipe for Mizutaki, which you can easily make in our Gourmet d’Expert® Electric Skillet (EP-RAC50) and let us know how you like it! And don’t forget to share your Fukuoka stories with us below. Planning on making a gorgeous dinner with some ooey, gooey chocolate for a fantastic finish? Short on time and needing some inspiration? Our product of the month–the Gourmet d’Expert® Electric Skillet—is the perfect tool for earning you major accolades (and hopefully many kisses). The Gourmet d’Expert® Electric Skillet (EP-PBC10) is the smaller of the two models in its eponymous line. The cooking pan has a 10 ½ inch flat-bottomed cooking surface which makes it simple to prepare eggs, pancakes and crepes in the skillet. The sides of the cooking pan are 2 ¼ inches high, which is ideal for sautéing, stewing, braising and steaming. And the temperature control plug lets you adjust the cooking temperature from 176 F, which keeps food warm, to 430°F. 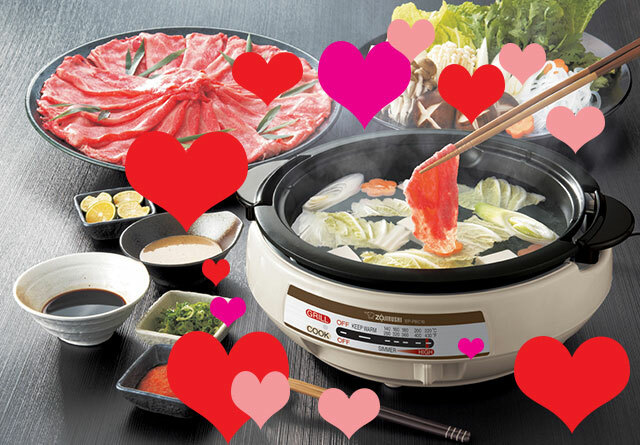 These three great features, coupled with the titanium and ceramic enhanced nonstick coating of the cooking pan, make this the perfect appliance for your Valentine’s Day meal! Dinner should of course start before dessert, even on Valentine’s Day, and we think you and your loved one will enjoy the flavors of Pepper Beef Chow Fun, easily prepared in our Gourmet d’Expert® Electric Skillet. This recipe calls for flank steak, marinated in a whiskey-infused sauce, which is sautéed with red and green bell peppers and fresh jalapenos for just a bit of spice! The beef and vegetables are then combined with ribbons of chow fun noodles that have been sautéed until they’re golden and delicious. Paired with your favorite drink, and this quick-to-make, colorful and decadent dinner will surely please your palette. A quick rinse of the cooking pan, and you’re ready for dessert. 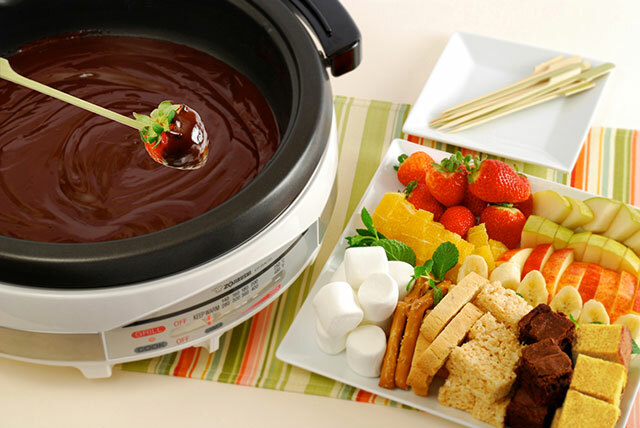 Chocolate must be on the menu, and what easier way to serve it than as fondue! Our Chocolate Fondue recipe is easy to prepare… simply combine whipping cream, bittersweet chocolate, vanilla and almond or hazelnut liqueur in the skillet and heat on medium until the mixture is smooth and creamy. The best parts of this dessert are the dippables! Arrange bite-sized pieces of juicy fresh fruit, buttery pound cake and brownies, crunchy biscotti and pretzels and soft marshmallows on a platter with skewers. 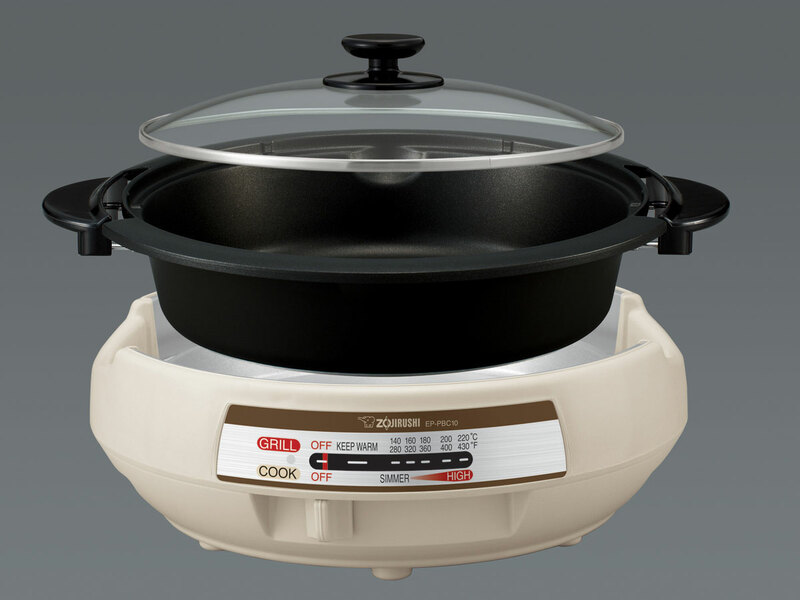 The power cord allows you to keep the fondue warm on a counter or tabletop and the stay-cool handles make it easy to move. All you have to do now is dip and enjoy! At the end of your meal, you’ll have fewer dishes to clean up and a lot more fun cooking tableside with your date. The Gourmet d’Expert® Electric Skillet (EP-PBC10) can be purchased on Amazon.com or at your local specialty Asian market. As you can see from the great reviews we get, the size, cooking surface, glass lid, detachable power cord and versatility of this appliance are exceptional. And best of all, you can even use the cooking pan on a conventional gas stovetop. We hope you and your sweetheart enjoy using it as much as we do! Contact us with any questions about the Gourmet d’Expert® Electric Skillet (EP-PBC10) and be sure to share your favorite recipes with us! Happy Valentine’s Day!